a) Cells are introduced into the cross-junction of the microchannel. The stress applied on the cell is optimized to disrupt the cell membrane and release subcellular components, while maintaining the integrity of mitochondria. The overview of the microfluidics chip is shown in the inset. b) The applied mean stress, modulated by controlling the volumetric flow rate for a given channel geometry, has been optimized by the maximal protein yield (an indication of quantity of the extracted subcellular contents) and the maximal mitotracker positive events (a hallmark of functional mitochondria). Results were obtained by shredding HEK293 cells (embryonic kidney cells, 106 cells/mL) by a range of shear stress and plotted as mean ± SD (n = 3 independent experiments). A finite element simulation model was established by COMSOL Multiphysics® to illustrate the fluidic flow at the cross-junction. Give a volumetric flow rate at 60 μl/min, c) illustrates the velocity profile and the stagnation point at the center (where the flow velocity is zero), and d) illustrates the stress distribution and the extensional flow fields around the stagnation point, which contributes significantly to the cell deformation and disruption. Credit: Microsystems & Nanoengineering, doi: https://doi.org/10.1038/s41378-018-0037-y. Mitochondria are dynamic, bioenergetic intracellular organelles, responsible for energy production via ATP production during respiration. They are involved in key cellular metabolic tasks that regulate vital physiological responses of cells, including cell signaling, cell differentiation and cell death. Defective mitochondria are linked to several critical human genetic diseases, including neurodegenerative disorders, cancer and cardiovascular disease. The detailed characterization of functional mitochondria remains relatively unexplored due to a lack of effective organelle extraction methods. For instance, the extraction process must sustain sufficient functionality of the organelle ex vivo to illuminate their cytosolic functions in the presence of cytoskeleton and other subcellular organelles. Since mitochondria grow in a complex reticular network within cells to undergo structural alternations, their intracellular characterization is further complicated. As a result, in vitro analysis of mitochondria remains the mainstream method, to separately extract and understand the intrinsic properties of mitochondria, without the interference of other subcellular organelles. In a recent study, now published in Microsystems & Nanoengineering, Habibur Rahman and colleagues at the Department of Biomedical Engineering explored the possibility of controlling hydrodynamic stress for efficient mitochondrial extraction. For this, they used cross-junction microfluidic geometry at the microscale to selectively disrupt the cellular membrane while securing the mitochondrial membrane's integrity. Advances in microfluidics have demonstrated the advantages of on-chip laboratory procedures with significantly reduced sample size and increased experimental reproducibility. Hydrodynamic stress produced in microfluidic chips can be used to open cellular or nuclear membranes transiently during intracellular gene delivery. The potential of such techniques has rarely been examined for extracting subcellular organelles since the constrained geometries of microchannels can cause subcellular component clogging in the micromachines. The authors optimized the experimental conditions of operation based on previous studies to effectively shred cell membranes while retaining intact mitochondria in model mammalian cell lines. The model cell lines of interest were human embryonic kidney cells (HEK293), mouse muscle cells (C2C12) and neuroblastoma cells (SH-SY5Y). In the working principle of the proposed microscale cell shredder, the scientists measured the difference in elastic modulus between the mitochondrial membrane and the cellular membrane to disrupt the cell while retaining the mitochondrial membrane. An increased stress level in the system could disrupt cell membranes with higher elastic moduli (as seen with the neuroblastoma cell line). The study compared the protein yield and the concentration of extracted functional mitochondria using the proposed method vs. commercially available kits for a range of cell concentrations. 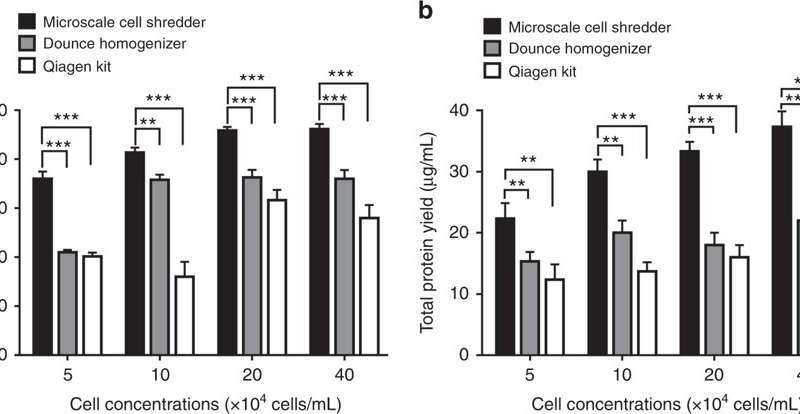 Cell disruption and protein extraction efficiency using the microscale cell shredder, the Dounce Homogenizer and Qiagen Mitochondria Isolation Kit. a) Cell disruption efficiency, determined by the fraction of disrupted cells against total number of intact cells, was quantified at different cell concentrations. b) After the centrifugation steps, total protein yield was determined accordingly. These experiments were conducted using HEK293 cells. Results were plotted as mean ± SD (n = 3 independent experiments, **P < 0.01, ***P < 0.001). Credit: Microsystems & Nanoengineering, doi: https://doi.org/10.1038/s41378-018-0037-y. The findings showed the proposed microscale cell shredder method was more efficient than the commercial kits by yielding approximately 40 percent more functional mitochondria. The scientists were able to preserve the structural integrity of the extracted organelles even at low cell concentrations. The method could rapidly process a limited quantity of samples (200 µl). The detailed outcomes were a first in study demonstration of intact and functional mitochondria extraction using microscale hydrodynamic stress. The possibility of processing a low concentration and small sample size is favorable for clinical investigations of mitochondrial disease. 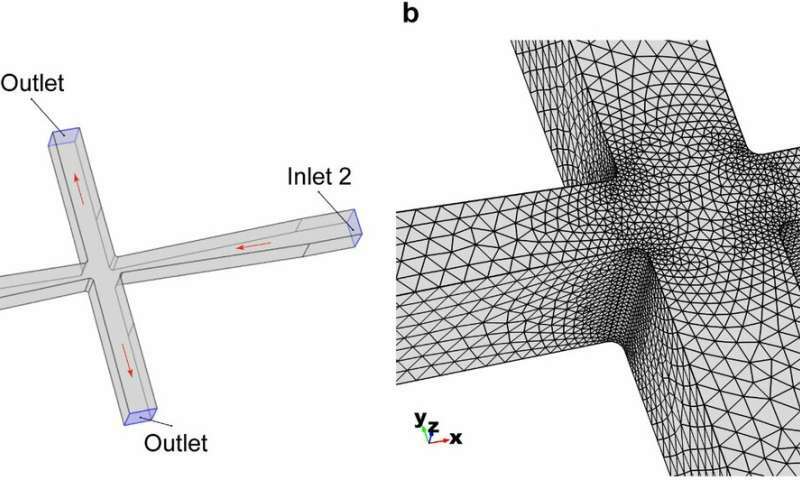 To test the stress exerted by the designed cross-junction, they used a COMSOL Multiphysics simulation model first. Thereafter, Rahman et al. experimentally determined the volumetric flow rate for three model cell lines. During experimental cell membrane disruption, under mean shear stress (16.4 Pa, for a 60 µL/min flow rate), subcellular organelles were released and detected with increased mitochondrial positive signals. The scientists compared the capacity of the miniaturized cell shredder with that of two commercial kits: the Dounce homogenizer (mechanical method of cell disruption) and the Qproteome mitochondria isolation kit (chemical method of cell disruption) to extract mitochondria. To determine the number of functional mitochondria extracted, the scientists used MitoTracker—a fluorescent dye that stains mitochondria during flow cytometric analysis. The results showed that the microscale cell shredder was able to extract 40 percent more functional mitochondria compared to the commercial kits for both HEK 293 and C2C12 cells. Disruption of neuroblastoma cells (SH-SY5Y) and the subsequent mitochondrial extraction. a Total protein yield and b concentrations of functional mitochondria obtained from the three extraction methods. Results were plotted as mean ± SD (n = 3 independent experiments, *P < 0.05, **P < 0.01). Credit: Microsystems & Nanoengineering, doi: https://doi.org/10.1038/s41378-018-0037-y. Rahman et al. conducted the citrate synthase assay to determine mitochondrial integrity through enzymatic activity of damaged mitochondria. 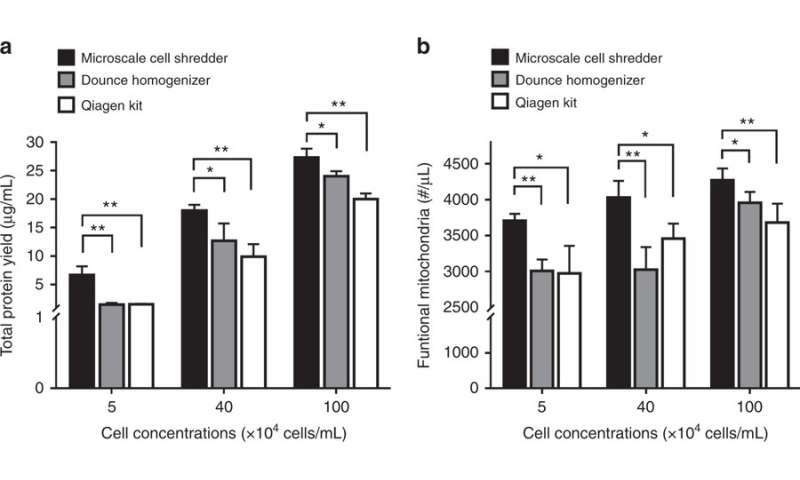 As before, compared to the commercial kits, mitochondrial integrity was higher for those extracted using the microscale shredder in HEK293 and C2C12 cells. The study demonstrated the importance of membrane stiffness by validating the proposed concept to disrupt neuroblastoma cell membranes (SH-SY5Y). Since the SH-SY5Y cell membrane had a higher elastic modulus than both HEK293 and C2C12 cell lines, the scientists had to optimize the volumetric flow rate in the microscale shredder for effectively disrupting SH-SY5Y cell membranes. Again, compared with the commercial kit extractions, using the proposed method delivered a significantly higher concentration of protein and functional mitochondria for the cell line of interest. In this way, Rahman et al. investigated the possibility of disrupting the cell membrane to retain the integrity of mitochondrial membranes in diverse mammalian model cell lines. 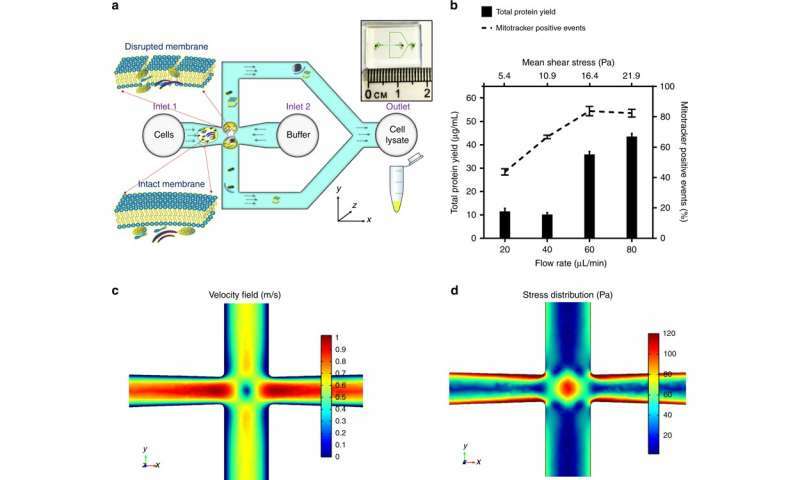 They determined the optimal extensional stress and flow rate inside a microfluidic cross-section bioreactor, based on the Young's modulus of the model cell line of interest. During channel design, the scientists included a necking section in the microfluidic bioreactor manufactured using soft lithography . The proposed microfluidics microscale cell shredder demonstrated superior capability for extracting functional mitochondria and proteins by controlling hydrodynamic stress for the first time, compared with commercially available cell organelle extraction kits. The experiments were feasible even with minute quantities of samples (200 µl volume, containing 104 cells/mL) for potential clinical applications. Rahman et al. were able to faithfully replicate the protocol across three cell lines. The experimental work can be translated to a clinical setting to understand mitochondrial dysfunction related disorders in depth.